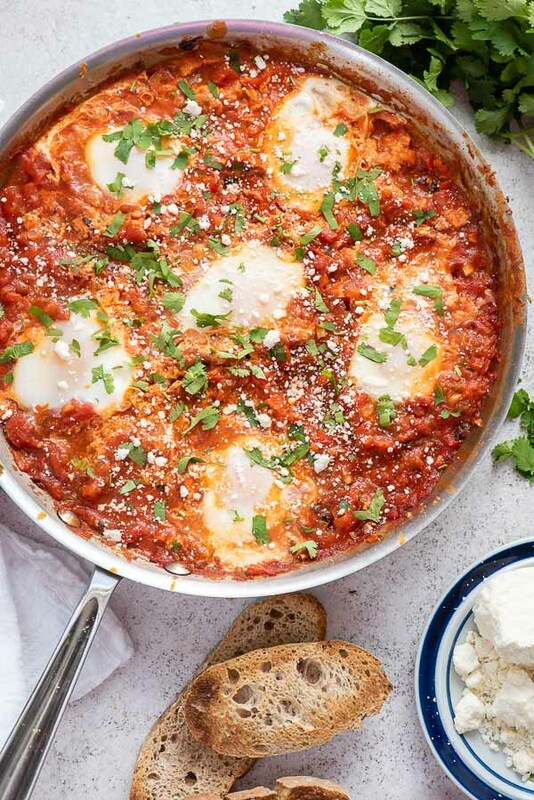 If eggs poached in an easy homemade spicy tomato-vegetable sauce topped with crumbled cheese and cilantro sounds good to you, you’ll love to start your day with this Shakshuka recipe! Crusty bread for dipping too. I love a spicy protein-filled breakfast especially on the weekend when I have a bit more time to cook. With Cinco de Mayo, I have been craving Mexican flavors for about a month now (check my Instagram Stories for regular margarita and taco appearances). 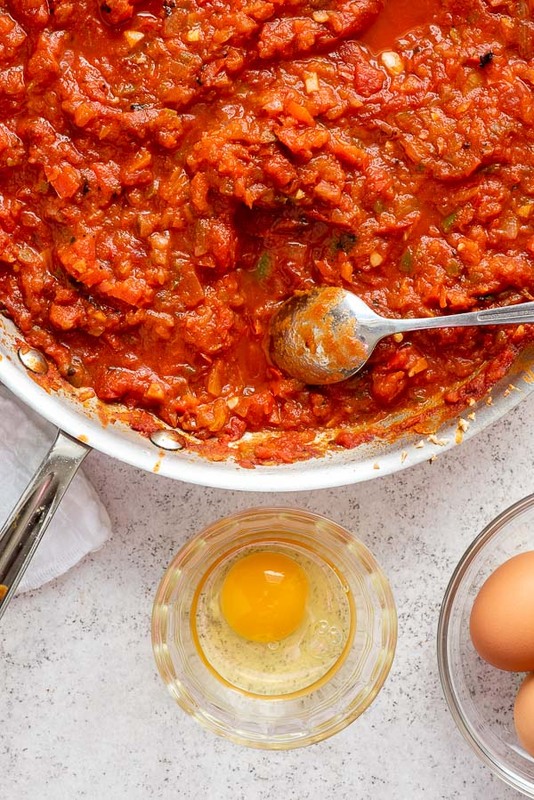 Today’s easy Shakshuka recipe is filling and pungent with earthy spices, and also easy to make. First, you may be looking at the word ‘shakshuka’ wondering how to pronounce it. ‘Shock-shoe-kah’ or ‘shack-shoe-kah’ are the most common pronunciations for this Northern African dish. 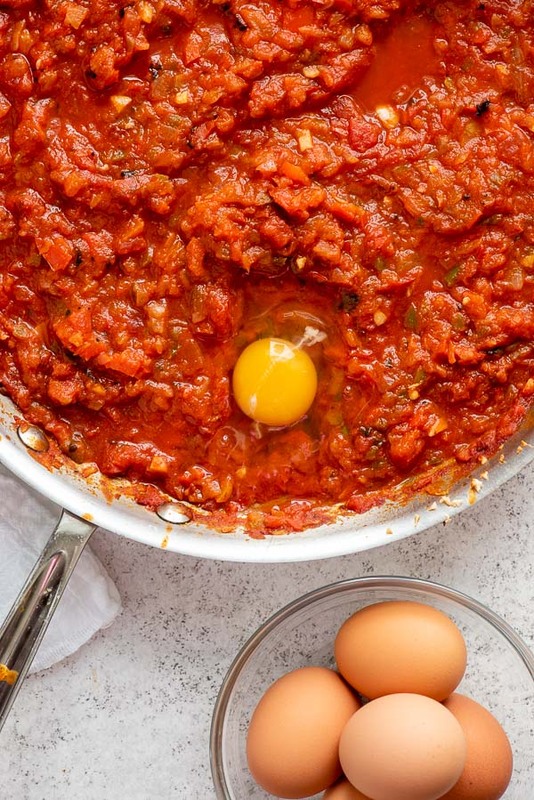 Shakshuka is a poached eggs recipe cooked in a thick, rustic homemade spicy tomato-vegetable sauce. It includes a fun trick of making indentations in the sauce itself so the eggs cook IN the sauce rather than being added before serving. A healthy scoop of the sauce is served with one or two of the eggs (my teen son came back for a total of three helpings) and some crusty bread for dipping. Tomatoes seem to be a polarizing vegetable, at least in my family. The dislike runs more strongly in the males for some reason. Just the remark of their presence can turn some off before the first bite. The aromatic spices of cumin and smoked paprika seduce anyone in the kitchen from the smell alone! Sautéed onion, sweet bell pepper and spicy jalapeno pepper lend a wonderful contrasting set of flavors to the sweet crushed tomatoes. 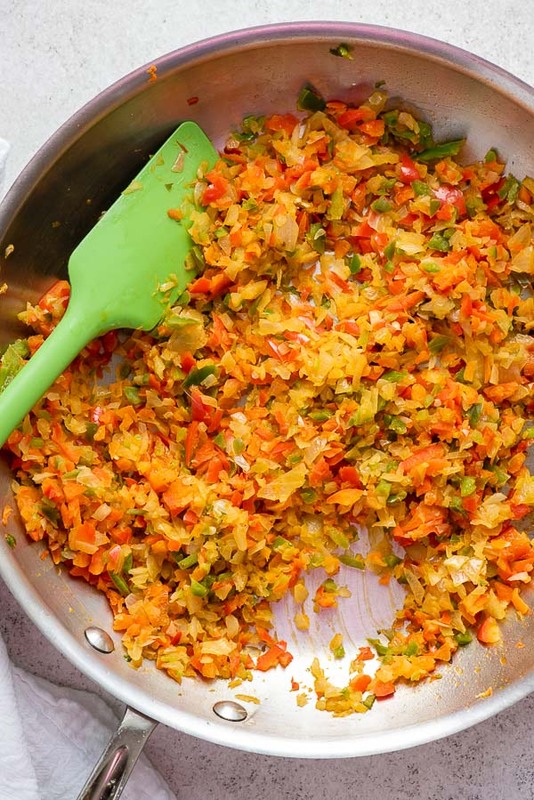 Olive oil is heated in a large skillet to sauté chopped onions, bell pepper and jalapeno pepper until soft. Aromatic spices and kosher salt are added to the vegetables to cook for 2 minutes. Finally the crushed tomatoes are added and simmered for 20 minutes making a flavorful thick sauce. Once the sauce has simmered, divots or indentations are made with a large dining spoon, large enough to fit one egg. 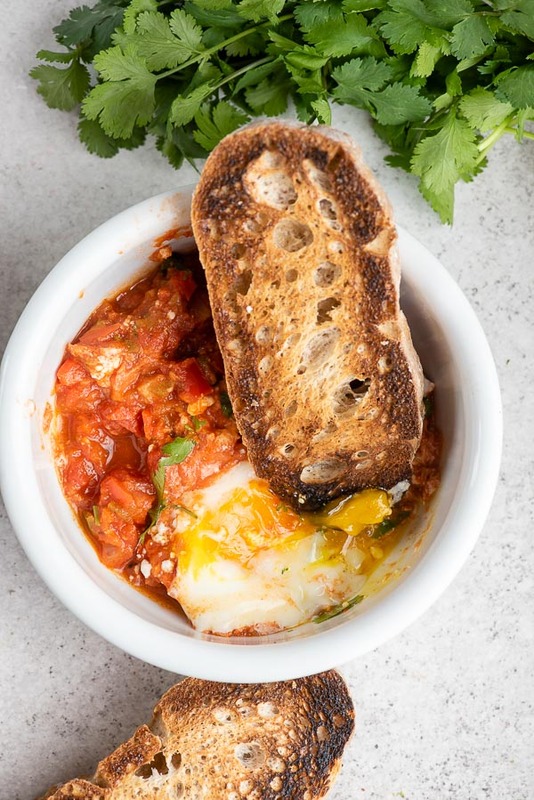 PRO TIP: instead of cracking the egg directly into the prepared indentation in the spicy tomato sauce, the egg is first cracked into a ramekin or small bowl. Then the egg is gently slid into the select spot. This controls the egg placement and aids in not breaking the yolk! Once all the eggs are in place, the skillet is covered and the eggs allowed to poach gently in the sauce for 8-10 minutes until the whites are cooked and the yolk will still run when cut into. 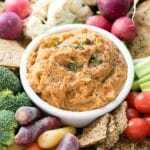 A scoop of the sauce, an egg or two are served with crusty toasted sliced of bread! TIME SAVING PREP TIP: I prep everything I can in my mini chopper. I use it to chop the onions, bell pepper, jalapeno pepper and the garlic cloves. It is a definite time saver. Is It OK to Cook Tomatoes in a Cast Iron Skillet: Yes or No? I dug into the caution to NOT cook acidic food in cast iron skillets after running into tomato-based dishes in cast iron skillets all over Pinterest. The issue or belief is that highly acidic foods like citrus or tomatoes will leach metal from the cast iron into the food. Apparently, according to America’s Test Kitchen, the issue is not danger from consuming the trace amounts of metal but that you can taste it in the recipe being made. Using a well-seasoned skillet is a must. ‘Well-seasoned’ meaning it will have a semi-glossy surface from cooking that coats the pan in such a way that the metal from the skillet is protected. This would aid in the metal not being easily leached into the tomato-based food. Despite there not being consumption safety issues, I would recommend using a non cast iron skillet if possible to produce the best tasting Shakshuka. 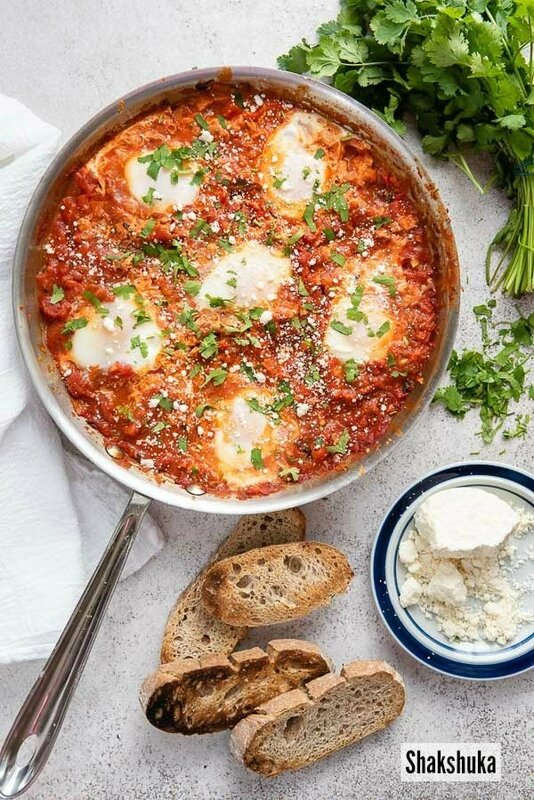 If you’ve tried this Shakshuka recipe or any other recipe on BoulderLocavore.com please don’t forget to RATE THE RECIPE and let me know where you found it in the comments below, I love hearing from you! 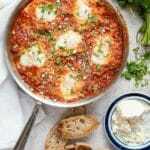 Shakshuka is a delicious spicy homemade tomato-vegetable sauce which eggs are poached in. 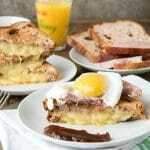 It's an easy recipe and one that always dazzles for breakfast or another time of the day! Heat the oil in a large skillet over medium-high heat. When the oil’s surface ripples add the onion, red pepper and jalapeno. Cook until soft (5-7 minutes). Add the garlic, cumin, smoked paprika, cayenne pepper and salt; cook 2 additional minutes. Lower heat to medium or medium-low, add the tomatoes with any liquids; simmer uncovered for 20 minutes stirring periodically. To add the eggs: crack an egg into a ramekin or small bowl. Using a larger dining spoon, make a divot or indentation in the tomato sauce large enough to fit the egg (planning out enough room for all 6 eggs with space between). Gently pour the egg into the divot and repeat for remaining eggs. Cover and cook over medium heat until whites are done but yolk is still runny; 8-10 minutes. Serve with a scoop of the sauce, egg and crusty bread. 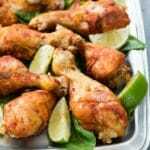 My family loves anything spicy, such a great easy recipe! I get this often my fit foods, but I didn’t know how to make this. I love this dish. I love this meal! 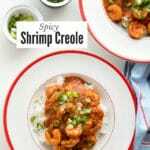 Thanks for sharing, I’m inspired to make this for dinner this weekend! 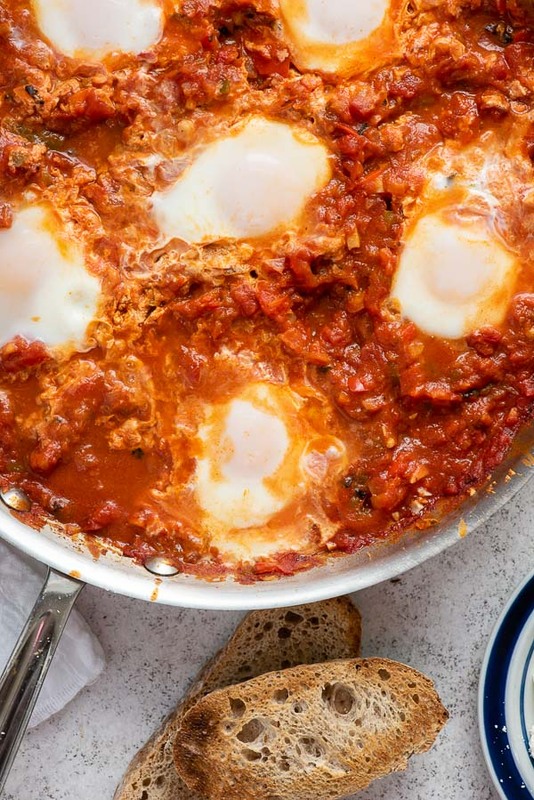 This is an incredible shakshuka, and I love the crumbled cotija! This is my favorite breakfast for dinner recipe. One of my favorite breakfast for dinner meals! one of my favorites! love these flavors! Definitely going to try this at our next brunch gathering. The flavors look amazing. It’s really SO good and so easy to make! Will you let me know what you think once you’ve made it? I love making shashuka and I love how heathy it is too! I can’t wait to try your version! YUM!